A little while back I took a look at the Top 20 Bulgarian Wines as voted by Bacchus Magazine. I also reviewed some of the Bulgarian beers in this article too. But today its the time of year when nothing like a good wine will do. For three must try reds, and one amazing white, read on for our tasting and for our surprise winner. But first, as a wannabe gastronaut, I invited three friends round to also test my new risotto recipe. But as I expected, their main interest was in the wine from three wineries, so I’ll talk about risotto another day. Â Bulgaria’s wine industry is growing and the high quality surprised me on my first visit to Bulgaria. But Â the judges at Bachuus, and the International Wine Challenge also know a thing or two – and if you are reading this and are still unsure about Bulgarian wine — then grab a glass and read on. Oh and do please comment — let us know which ones are your favourites, or share your new “finds”. Â All these four wines, can be found in the better supermarkets in Bulgaria such as Picadilly, Fantastico and Billa and even in Bansko. In Metro they are 2 to 4 lv cheaper. Comment: We agreed that this is a huge big wine — and perfect for winter roasts (and my risotto of course). This is the one that packs so much in, and the depth of dark fruit flavour goes on long in the mouth. Worth the money? If you want a big wine for a special occasion then and want to impress your guests with a Bulgarian wine, then this delivers a lot in for your 22 lv. It’s worth taking a look at their web site… I like the background story to the Bessa Valley. .. The site then goes on… “2,500 years ago, this was the valley of the Bessians, the most rebellious of Thracians. They safeguarded and kept the sanctuary of theÂ God of wine and were known as the most competent in his cultâ€™s rituals. Hellenes from the south polis called it â€œTwice bornâ€, Dionysus. Could that have been a prophecy about the revival of the Valley and its wine? mmm nice story… You’ll also read there how Stephan von Neipperg the man behind Enira is a large investor in Bordeaux estates, and that he has to be credited for probably doing more than anyone else in raising the profile of Bulgarian wines on the Â international fine wine scene. Comment: Â Situated close to the Turkish border in the south of Bulgaria, the Terra Tangra Cuvee (“The Cuvee”) has won so many awards, that even the most die hard cynic of awards, money and corruption would be hard pressed to believe that this wine does anything other than impress. Especially with a silver medal from Decanter World Wine Awards in London, I was particularly looking forward to this one. In short the two girls probably preferred this one to Enira and I think, on balance, so did I. Quite simply I think it is the most stunning wine. On balance although I am not sure we all agreed, that this was our (my?) red wine winner. Just a perfect blend with, as the web site tasting notes say, hints of herbs, blackcurrants and… well just a really harmonious wine. This Terra Tangra wine had a mineral quality for me. Â This is something I really like in a wine, and is so often missing from hotter climes wines — Â Australian wines in particular. It’s worth noting their cheap blend “TT” is a good value quality wine choice to order in the Victoria Restaurant, situated near the gondola in Bansko (opposite the Kempinsky, Grand Arena hotel). Bulgarian white wines have been a very hit and miss affair for me. For a while, Tcherga produced an acceptable white before the price went up — and the quality went down. So this “find” from my guest, was inspired. Black C was the biggest surprise of the evening for me. Just the best Bulgarian dry white wine we had tasted. A real thumbs up from the Bulgarians amongst us and, in many respects, this wine should be a huge hit with everyone who tries it. If you have been avoiding white wines in Bulgaria, like me, then now is the time to take a closer look. In fact all of Santa Sarah wines look very interesting and their red wines, Santa Sarah bin 40 and 41 have won awards as has their sweet ice wein, “Snow White”. I can’t wait to get my hands on a bottle of this wine — it must be a perfect match for a winter chocolate pudding. Comment: Producing over 2 million bottles of wine per year and exporting 40%, it would be surprising if you had not seen Telish in Bansko’s supermarkets either in bottle or in box form as we tasted. Bansko supermarkets sell this for around 20 lv for a box which holds the equivalent of Â four 75cl bottles. Metro in Blagoevgrad / Sofia sell this for 16lv (4lv a bottle). This wine is the best everyday drinking wine. This is quality wine, smooth and very drinkable without needing food. The rear of the box, see below, makes amusing reading — and I have to agree. 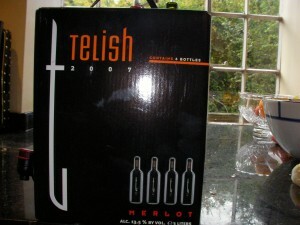 Telish beats other cheaper wines in a box, such as Mezzek. Cabernet Sauvignon Telish is also very good — but after extensive tasting of both, I’m on the side of the Merlot. Perfect to sip with a few cheese nibbles before dinner after coming back from the pistes or a long hike. For those bringing UK pounds to Bulgaria this winter, Telish is another way of keeping your holiday costs down. Stock up in Metro in Blagoevgrad (a passport gets you entry) grab a box or two of this and ask your friends to help themselves. 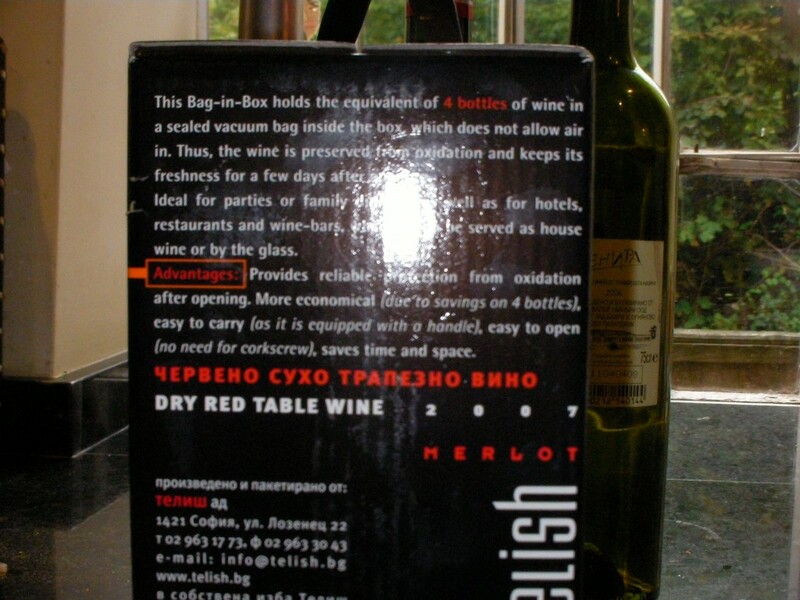 A box wine is apartment friendly and the wine stays fresh for a whole week. No corkscrew to find. This wine finally dispelled all my prejudices against such box wine. Tip: Be sure to remove the bag to squeeze out that last glass . My rating below, like the others, includes value for money — so overall this is the winner! More Info: https://www.telishwinecellar.com/ (under construction) telish.bg no longer exists. 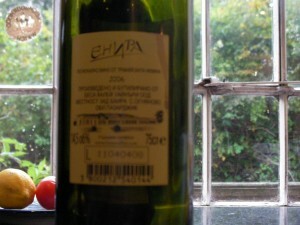 Bulgarian wine is well worth investigating ….uhh, well, drinking really. The Black C white wine was my biggest surprise in this review. It is a stuning white. I rate it Â is as good as many a more expensive Chablis. Â I really am looking forward to trying more from the guys at Santa Sarah. For overall everyday value the Telish wins, as Â Iwould be happy to pay over 30% more for this quality of wine. The Terra Tangra Cuvee was my favourite red and beats the other Bacchus Magazine Top 20 red wines I have tried. The Enira, from Bessa Valley Winery, is also very special. Just be sure to be in the mood for such a huge, deep and powerful wine before opening. So your comments are really sought on wine in general. Any real finds you can share? Â If you are Â a winery, producer or retailer, and think I’ve missed something out, then do please comment below or contact me. If you’re looking for a second opinion — just email and I’ll be round to join you in a taste: just don’t bother to bring out the spittoon. If you enjoyed this article, why not sign up for more? Join for regular news, reviews, updates and comment. But first, as a wannabe gastronaut, I invited three friends round to also test my new risotto recipe. Â But as I expected, their main interest was in the wine from three wineries, so I’ll talk about risotto another day. Â Bulgaria’s wine industry is growing and the high quality surprised me on my first visit to Bulgaria. But Â the judges at Bachuus, and the International Wine Challenge also know a thing or two – and if you are reading this and are still unsure about Bulgarian wine — then grab a glass and read on. Lance, thank you for your engaging wine review! I completely share your opinion of the winners. 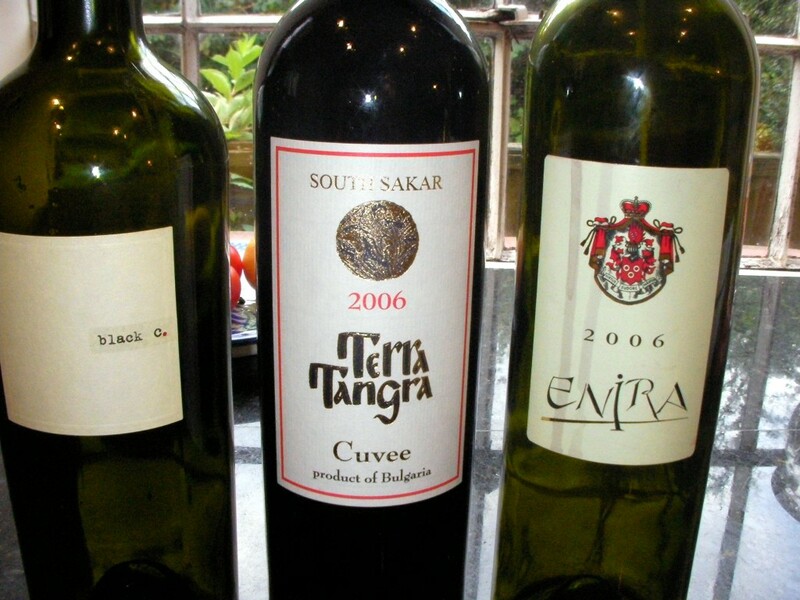 Enira and Terra Tangra Cuvee are just great and so are the other expensive wines of Bessa Valley and Santa Sarah. To the high end, I would also add a couple of excellent red wines I have tasted – ReDark (60% Cabernet Sauvignon & 40% Merlot; 14 euro) and Uniqato (dry red wine; 10 euro) both by Damianitsa winery (https://melnikwine.bg/wines.php). Most people talk high of Katarzyna Estate's Contemplations and Question Mark, but I have not personally tasted them (https://katarzyna.bg/pub/article/20). I'm also curious to try the Black C. red (Merlot, Cabernet Sauvignon and Rubin). However, the cheaper versions of some of the above wineries are not as impressive. I have always found it difficult to buy a good wine in the cheaper range (4-5 euro a bottle) so I have stuck to Telish. I needed some variation so I experimented with a red I heard was good – biCycle by Minkov Brothers (Merlot & Pinot Noir) – and I'm really happy with the result! I'd be glad to read about other people's findings in the "everyday" wines range. Vania, thanks you for wine tips – biCycle sounds like a fine alternative to to Telish . Great article. Just a note on Enira – the winemaker is Marc Dworkin. Hey I just came across your site. I am nesting in a small village in Bulgaria for the winter and looking forward to following your blog. I will try to search for some of the wine you have posted. I write more in the deeper levels of the culture. Thanks for this insightful review on Bulgarian wines. For those who live in the US https://www,bulgarianwine.com, based in Sonoma, California, delivers award winning wines. A whole sampler case of 15 bottles for just $99.00 sounds like a good deal to me, even if you add shipping and handling. Good article. Many thanks for this link and glad you enjoyed article. There are many Bulgarians living in the US (there are after all nearly 1 million Bulgarian expatriates scattered around the world). And enjoying wine is a superb way of starting to learn the Geography and History of a country that for many is perceived as of little interest. 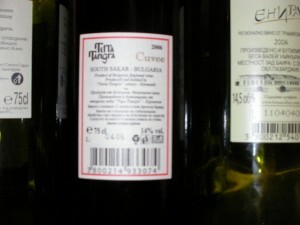 Bulgarian wine has come a long way – and perhaps now is its most positive international image. How times change. The TT Cuvee is indeed excellent. Contemplations and Twins from Katarzyna Estate are also very nice. However my favourite wine so far is from Todoroff winery near Plovdiv. Their Mavrud Gallery is lovely and my favourite Bulgarian wine so far. Thank for your comment! Glad you like these wines…and I have my review of contemplations which am yet to publish; but I too agree that it was really special, especially when METRO were selling it at half price in November. I also need to get my hands on your Todoroff Mavrud Gallery plus a Melnik wine I tried in a shop recently. keep these recommendations coming… anyone found a better wine for the money than Telish (cab sav/merlot) in a 4 botthe box (15lev at METRO)? Black C is definitely the winner, I found it yesterday in Fanatstico store for 12.50 leva and enjoyed it a lot. I suppose there are even better choices, but could only be found in small wineries away from Sofia. I am so pleased that you liked this Black C wine. It is a case (no pun intended) of selling quality wine at an affordable price – and yes it's widely available. In September I am going to a very small boutique winery (and hotel) near Karlovo and look forward to reviewing this and, as you say, some smaller producers. Thanks for stopping by and letting us know. Anyone else have their wine discoveries and recommendations they can share here? I suppose you mean Starosel winery. I have never been there, but I've heard good things about the complex – few underground floors and wine tasting and so on. Thank you Atanas, I wil now also try Starosel when there. But I was referring to Zeyla wine at Chateau Copsa. I've heard the addition of herbs create quite an individual wine here. Hi! I write a blog http://www.chasingthevine.com and a wine column for the Village Voice in NYC. 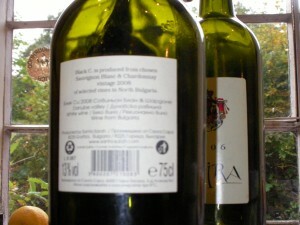 I would like to do a piece on Bulgarian wines, but am having trouble tracking down bottles to sample and review. Any ideas would be greatly appreciated!